Author Hannu Rajaniemi (b. 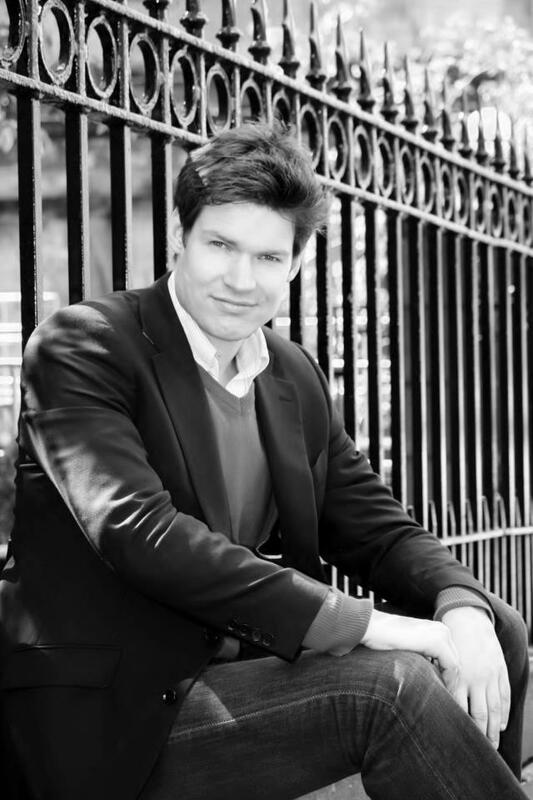 1978) currently lives in Scotland and writes in English. He has studied at the universities of Oulu, Cambridge and Edinburgh and completed his Ph.D in string theory at the University of Edinburgh. He has published several short stories and one novel, The Quantum Thief, which was translated into Finnish in February. The novel is the first of a trilogy, and he is already writing the sequel. Hannu Rajaniemi visited the Akateeminen kirjakauppa bookstore in Turku, on Saturday, 4 June 2011. He attracted a considerable audience. People listened and asked questions as the writer talked about his book and writing. He was interviewed by Shimo Suntila, a sf/f veteran from Turku. There were several members of Spin’s editorial staff in the bookstore, and it is our pleasure to cover the event for those readers who could not make it there. After the interview and book signing, Hannu and some members of the audience went to Café Art to continue the discussion over a cup of coffee. On the next day, Hannu attended the International Science Day seminar which was a part of Turku Capital of Culture year programme. In the seminar, a number of leading European quantum physicists came together to introduce the field’s latest discoveries to ordinary laymen. Shimo: Is it true that only you got the book deal for the trilogy on the basis of only one chapter? Hannu: Actually, when I got the book deal, I didn’t know that the story would grow into a trilogy. In addition, I had already published a few short stories at that point, so the chapter was not the only text the publisher had read from me. Shimo: What is your vision of humanity’s future? Hannu: Collaboration between the human mind and the machine. In a way I think it’s quite likely that our relationship with computers and technology becomes much more intimate. It’s already possible to create different interfaces between the brain and computers. For example, it’s possible to move a cursor on the screen with the power of thought, or to control a robotic limb. It doesn’t mean we’re able to read thoughts, but we’re capable of giving a human being an extension towards the digital world. I believe that development like this will probably take place. Shimo: In The Quantum Thief and in your other texts, too, quantum dots are an essential thing. If we speak in school physics terms, what is a quantum dot and how does it work? Hannu: I must say that the quantum dots in The Quantum Thief are a little more magical. The technology is quite difficult to explain at this point, but it might be developed in the future. The term and the idea come from the field of real physics. Quantum dots are electron clusters which are created in semiconductors, kind of artificial atoms which behave like atoms, at least to some extent. However, the structure of their virtual electron shell can be modified, so they can be used to build matter which can be manipulated. The American inventor William McCarthy has taken this idea quite far. Shimo: Quite far? What kind of innovations would we need in the world today to be able to create matter like this? Which things are already there and which are still needed? Hannu: In the field of quantum dots, it’s quite difficult to estimate. But if we think that there are physical items or organisms which can be programmed, then we must be getting close to having programmable biological organisms. It was only last year when a researcher, who was one of the main forces behind the Human Genome Project, revealed a bacterium with a completely artificial, man-made genotype. They had thought really closely about the proteins which the bacterium produces, and the way the bacterium behaves. Maybe this way leads towards incorporating the digital world with the physical one. Shimo: I already mentioned a couple of your texts but didn’t name them. I was talking about the short stories ”Elegy for a Young Elk” and “His Master’s Voice”, which have also been published in Finnish. They both include quantum dots and smart matter and other similar elements. Do the stories belong to the same universe with The Quantum Thief, since the book is not about the Earth? 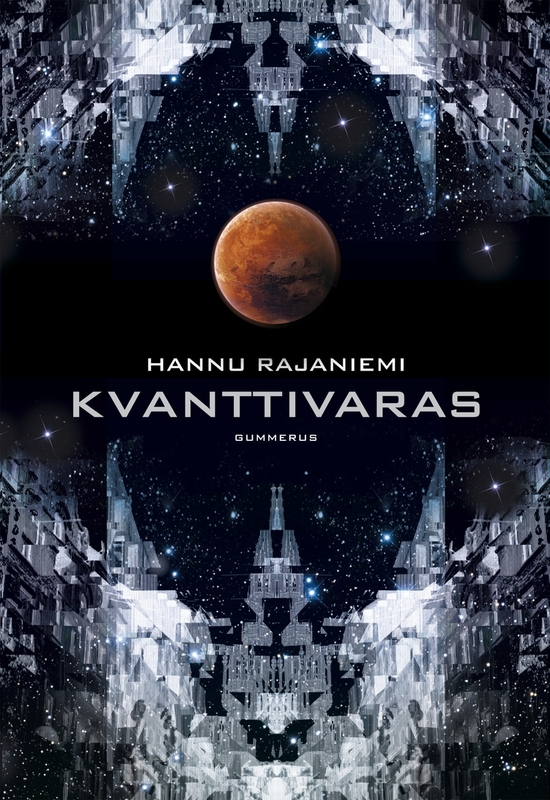 Hannu: “His Master’s Voice” takes place in the same world, in the The Quantum Thief’s past. I’ll have to promote this short story for those who haven’t read it by telling that it’s a science fiction version of the old Puss in Boots story where the brave cat and dog rescue go through a series of adventures as they save their master from trouble. 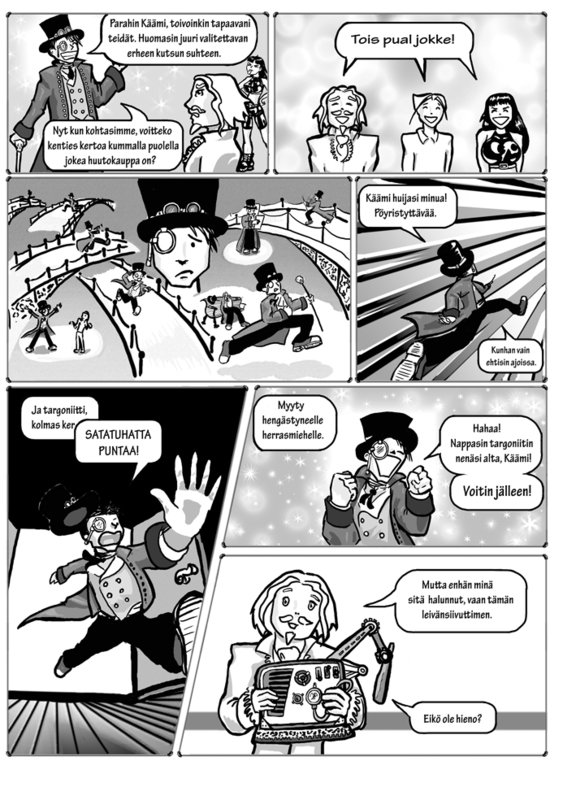 Shimo: “His Master’s Voice” has been published in the Finnish online magazine Usvazine, which means everyone can find it and read it. Just google the story’s Finnish name, “Isännän ääni”, and Hannu Rajaniemi, and you’ll find it. Shimo: Science fiction means many things, but one of its themes is that it speculates about the future. What is going on in the literary field right now, what are the clearest visions in today’s science fiction? Hannu: To me, it appears that science fiction writers have caught on cognitive neuroscience. New instruments have been invented during the last ten years, and with them it’s possible to measure brain functions closer than before. The understanding of the human mind is growing more and more into an empirical science where it’s possible to take a look at what happens inside the head. It’s all still in square one, but there are science fiction writers like Scott Bakker, whose book Neuropaths speculates what might happen when we the mind’s architecture is altered. In a way human beings become aliens instead of finding aliens in the space. Shimo: You’re still writing two novels which take place in this world. Which places will the books shed light on? The Quantum Thief mainly takes place on Mars. 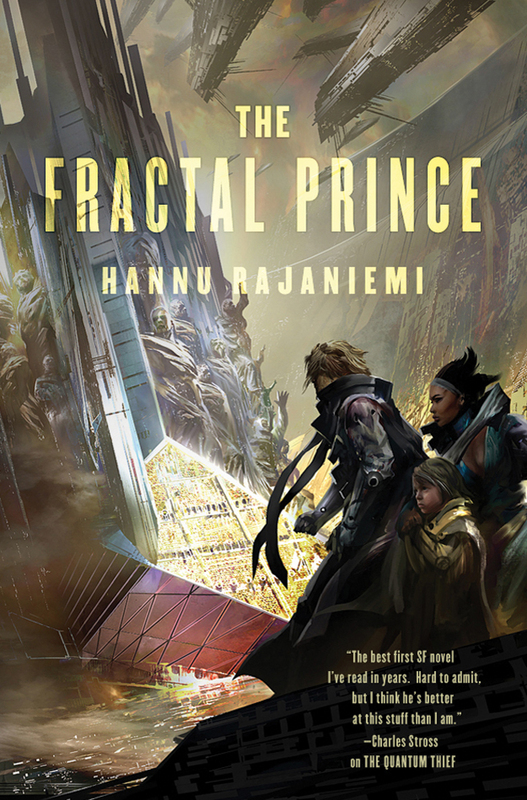 Hannu: In the next book, The Fractal Prince, which I’m writing right now, we will see planet Earth. The Quantum Thief only hints about what happened there. 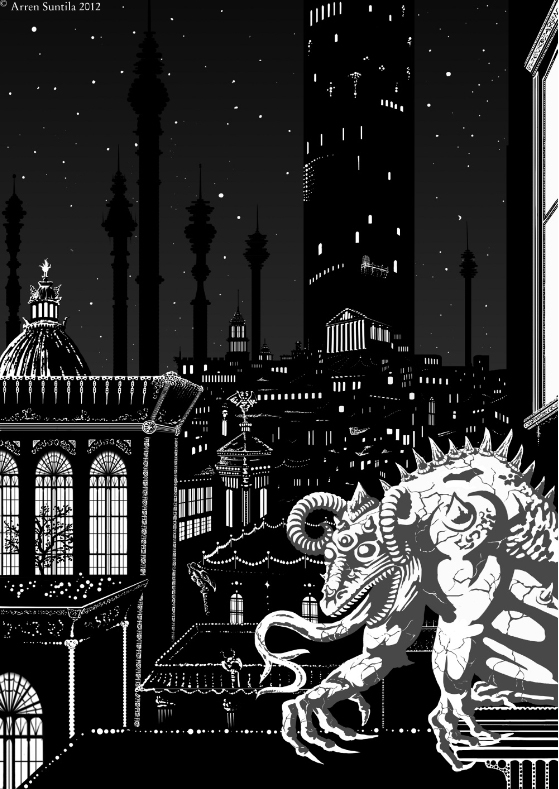 There is, for example, a town with jinns and flying carpets and Arabian Nights style constructions. Shimo: Is it likely that the story will only take one book plus the following two? A certain George Martin started writing a fantasy novel which expanded into seven. Do you already have a tight plot in your mind? Can you say that this is it, or is it possible that the story will spread? Hannu: I mean to finish the story in the three books. In fact, my book deal was originally for three books, not for a trilogy. I tried to cram all possible ideas I had into the first book, but then decided to expand it into three books. So the story has an ending. Shimo: Each writer has influences. Your reading has an effect on your thoughts. What are you reading right now? Hannu: At the moment I’m reading quite a lot of magical realism, which means Argentinean writers such as Julio Cortazaria and Jorge Luis Borges. There are many exciting themes in their texts which change the reality in an unexpected manner. 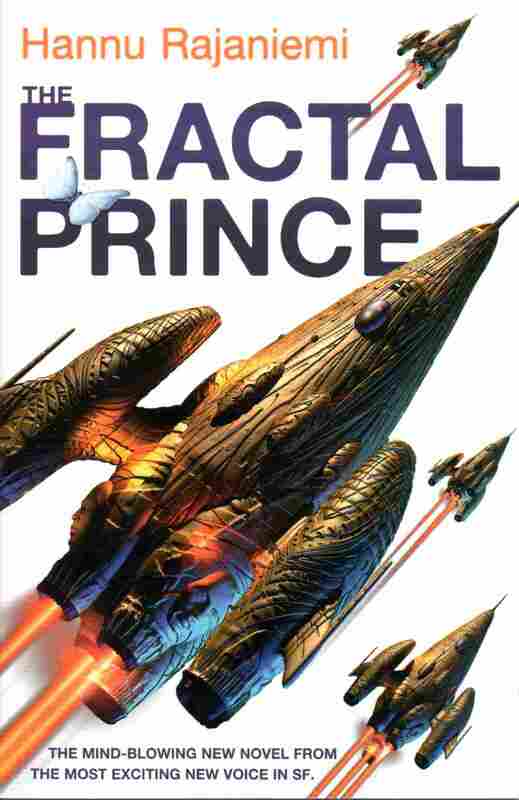 In The Fractal Prince, these themes become more concrete. These two authors are a good example of what I’m reading right now. 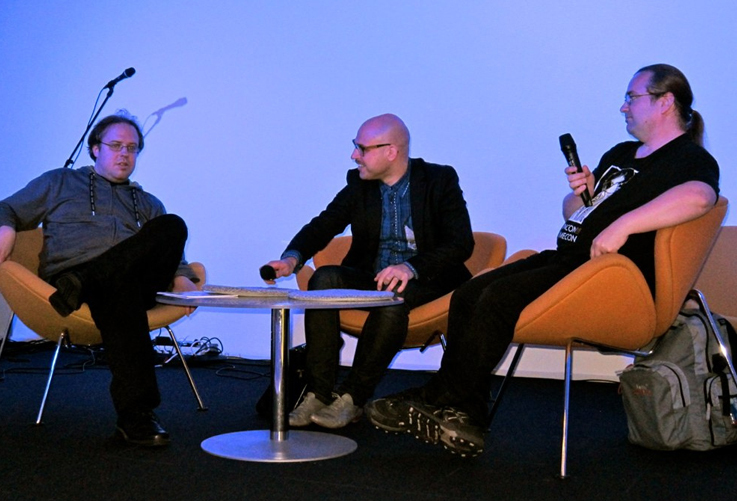 Someone in the audience: Hannu, your microphone went off. Hannu: It did? Did everyone hear me? Well, I guess you can hear me if I speak out loud. Shimo: You can also take my microphone. Shimo: Shared worlds. Some writers take a world which they have created and open it for other writers: come and play, it’s a shared playground. Would you be interested in participating in a project which someone else created? Hannu: Yes, possibly. I used to play role-playing games quite actively, and sharing the world was precisely the important element. It’s nicer to be creative together. It depends on the project, though. When it comes to my own worlds, I’m a bit possessive, because in science fiction, building the world is often intertwined with the themes, the characters and the story. But maybe I could join some bigger, shared project. Shimo: Actually, you just answered my next question. Would you be interested in creating a project in which others could participate? Hannu: Certainly, as long as time and energy permit. I used to do such things on the role-playing front. 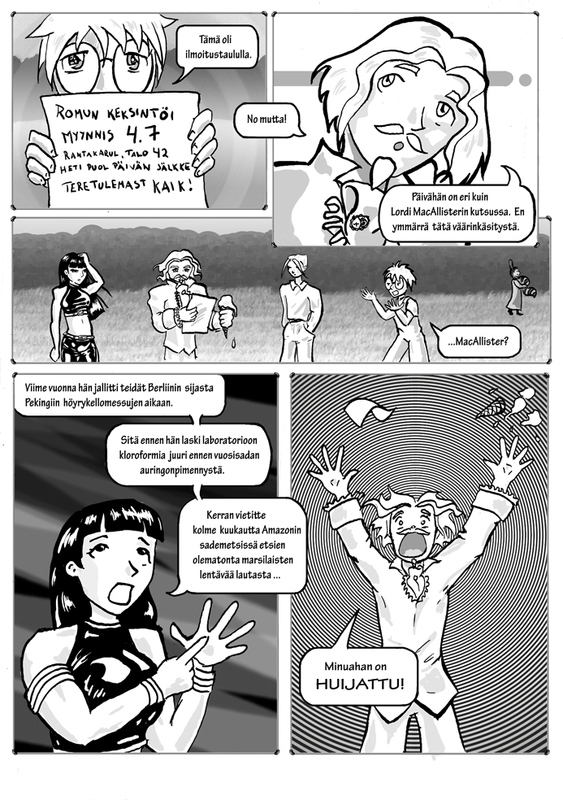 The role-playing club of the University of Oulu created a shared fantasy world where all kinds of exciting things took place. Shimo: What are your thoughts about fan fiction? Hannu: Positive. I think people have a right to use – I mean, if some people are inspired by the characters which someone created, why couldn’t they play with them if it feels natural to do so? Shimo: The next question is quite broad – you’ll have one minute to answer. Where is humanity going? Hannu: Humanity is going towards the future, following different paths. I hope it’s an optimistic future, although we have created some big problems for ourselves. People are currently talking about what is called the Anthropocene, the historical period when man really starts to control the Earth’s ecosystem and even its climate. As a consequence, it’s time we take responsibility for it. There is a revolution taking place for the first time in the history of science. Humanity’s role has usually grown smaller and smaller as we have learned about the world. 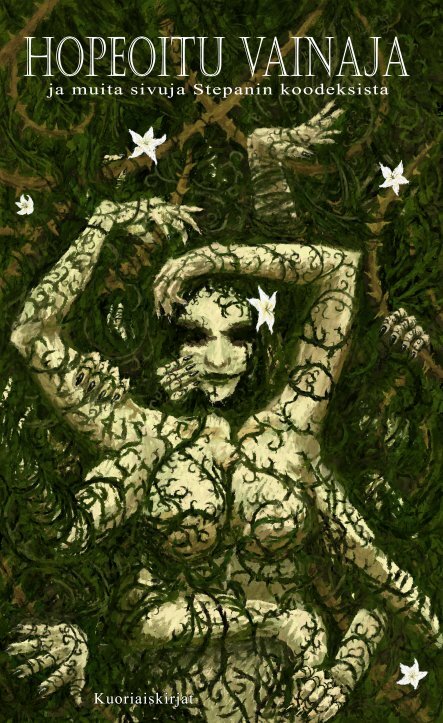 Right now things are turning upside down on Earth, and our role is bigger than the role of any other life form. It’s time we get a grip of ourselves and take responsibility for what we are doing here. Shimo: This gives me at tenuous link. You are one of the founders of a consultant company which works, for example, for the UK Ministry of Defence. You can’t reveal everything, of course, but is there something you can tell about what the company does? Hannu: In ThinkTank Maths, we try to use mathematics to solve real-life problems which come up in the industrial sector. Usually there are two problem types. In engineering sciences, there are technical problems which engineering maths can’t solve. Then there are the complex, operative problems of big companies, where you need to manipulate different resources and optimise their use. Shimo: It’s dawning on me that what you do could really offer this world some solutions. Hannu: Well, mathematics is quite a formidable tool and language to solve problems with. One fascinating branch of mathematics, which will also be important during the Anthropocene, is the understanding of complex systems such as the economy and biological systems. In these fields, we are still lacking proper mathematical languages we could use to solve problems. We really need them. Shimo: Does anyone in the audience have any questions, something new or some follow-up to what we have already talked about? Don’t hesitate. Someone in the audience: It’s clear that your Finnish is still very good, so the book is published in two languages which you know really well. What is it like? Usually when a book is translated, the writer thinks, “okay, a translation, greath, but has no clue what the translation is like. Hannu: In the beginning it actually a bit weird to read your own text as someone else’s translation. 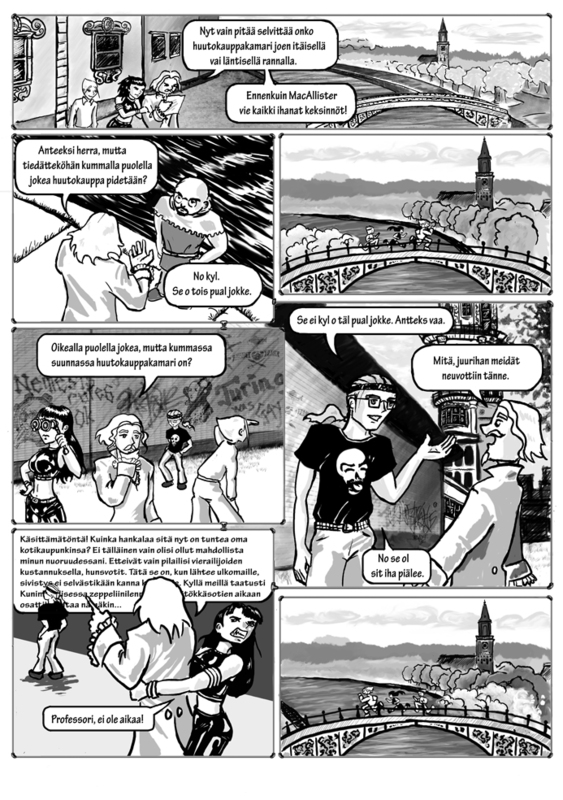 But when the Finnish translator Antti Autio and I started collaborating more, it turned out to be quite a nice process. I’m very impressed by what Antti has done, I don’t think I would have been able to do it myself. Somehow Antti has managed to translate the elements of the original text into Finnish. But it was a weird cognitive experience to read the English-speaking me in Finnish. Someone in the audience: Did you learn something new about your own book, about what you had written? Was there anything concrete, something that you grasped better or in a new way? Hannu: Maybe it brought up some stylistic things which I have in mind for the next book. 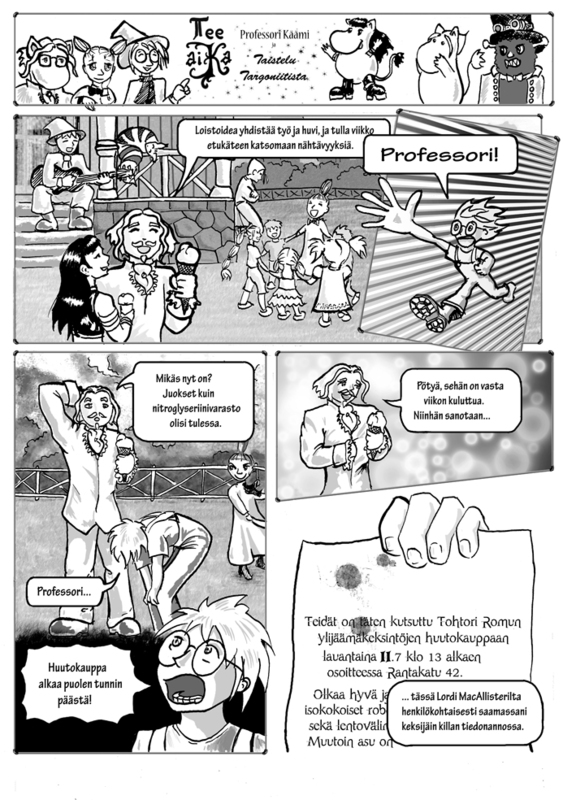 Actually Antti discovered a couple of holes in the plot, and we fixed them in the Finnish edition. In that way, the Finnish issue might have been even better. Someone in the audience: Writers always get this question, but who have been the biggest influences on your writing? Based on the Finnish translation, it seems you have read at least Reynolds and Simmons. Hannu: Actually, I haven’t read Reynolds, although I know Alastair Reynolds. I like Dan Simmons a lot, but I’d still say that my biggest influences have been Roger Zelazny ja Ian McDonald, to mention some. And of course Maurice Leblanc who created the Arsene Lupin character in the beginning of the last century. Shimo: Will you only write in English from now on, or do you plan to write something in Finnish? Hannu: Of course I get an itch to write in Finnish every now and then, and I suppose I will have to scratch it at some point in the near future. Shimo: What about our time – have we used it up or do we still have some left? Bookstore staff member: Feel free to go on for as long as you like. Shimo: I’m interested in hearing how you have settled in the British Isles. How is it, compared to Finland? Does travelling to Finland still feel like coming home, or is this only a curious place from the distant past where it’s nice to stop by? Hannu: Of course it feels like coming home, and sometimes I get really nostalgic about Finland. In the UK, you of course spot differences. For example, the banks, the railways and the traffic actually never work properly. Someone in the audience: It’s always better than the Finnish state railways. Hannu: Yes, I’ve heard about some Pendolino trains which have brought the railways’ reputation down. Scotland is a distinct place in the British Isles and I think that in many ways the Scots are like the Finns; they have the tendency to get a bit depressed, drink more than might be good for them, and they also have a problematic relationship with the neighbour who shares a long history with them. Shimo: Since there are several writers in the audience, do you have any tips to share? I’m sure they would love to hear something from a guy who made it. How do you get through? Hannu: Personally, my most important experience is learning to live with frustration. You need to learn to accept that if you want to do something creative, then at some point you inevitably end up in a situation where you’ve had enough and you’re running into a wall. 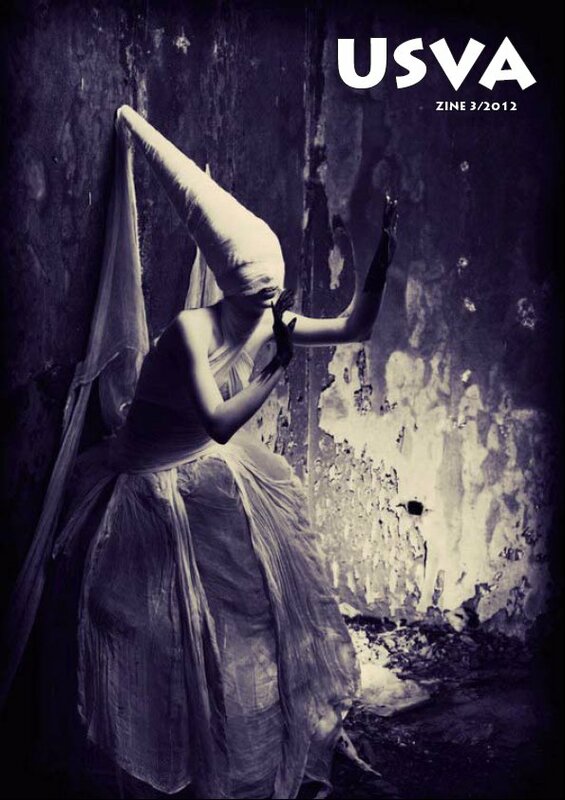 You just have to endure it until some stimulus brings you out of the darkness. And about getting published, I’d say you should take advantage of the publishing opportunities the Internet has to offer. Publish a lot of short texts, try different kinds of writing and find out which feels the closest to you. It’s also good to remember that traditional book publishers aren’t the only way. You can publish e-books and things like that at your own expense and get published that way. Shimo: Do you visit many science fiction cons and events? Hannu: I’ll be in Eurocon, in Stockholm, in a couple of weeks. Come there, everyone. I’ve also tried to visit Finncons if I have had the chance. Shimo: This year, Finncon is in the middle of July, in Turku. It’s a free event, so do come there. Hannu, too, if you still happen to be around. Hannu: I might have to skip it this time, but we’ll see. Someone in the audience: Is writing a lonely process for you, as they always say, or have you worked on your texts with the people around you when you have been in the phase where you run against the wall? Hannu: That’s exactly what I’ve done. Actually, that’s a tip I’d like to add. I recommend that you should join a writers’ circle. You get blind to your own texts so easily, and it’s really good to have someone who comments on them. In Edinburgh, we have an excellent circle, the Writers’ Bloc, whose member I’ve been for the last ten years and where I have learned everything I know about writing. The members of the Bloc played an important role in solving many blocks in the Quantum Thief trilogy. Shimo: There have are many other well-known writers in the Writers’ Bloc. Could you tell something about them? 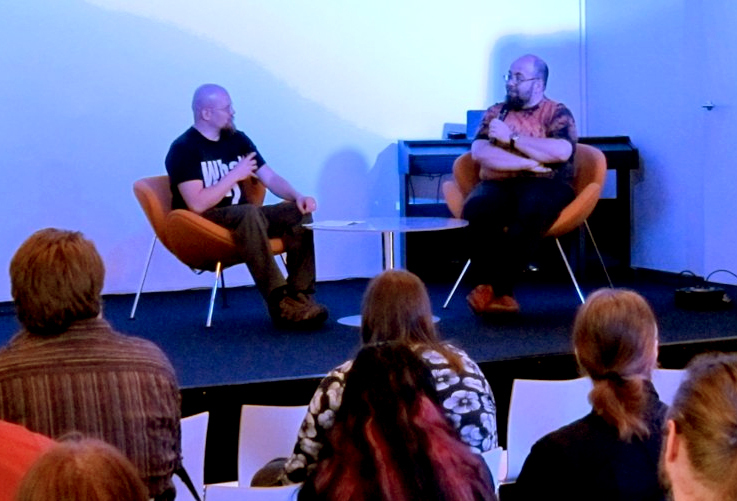 Hannu: Perhaps the best known is Charlie Stross, who hasn’t been translated into Finnish a lot but whose works I do recommend. Charlie is a very versatile writer who writes both thrillers with a supernatural, Lovecraftian twist, and lively SF which takes place in the far future, as well as sharp-eyed speculative fiction about the close future. 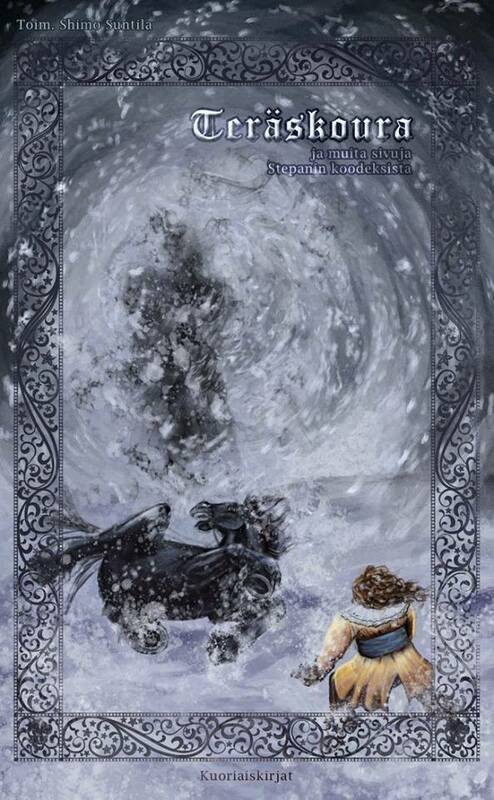 Another writer is Alan Campbell who writes fantasy and has published books called Scar Night and God of Clocks. 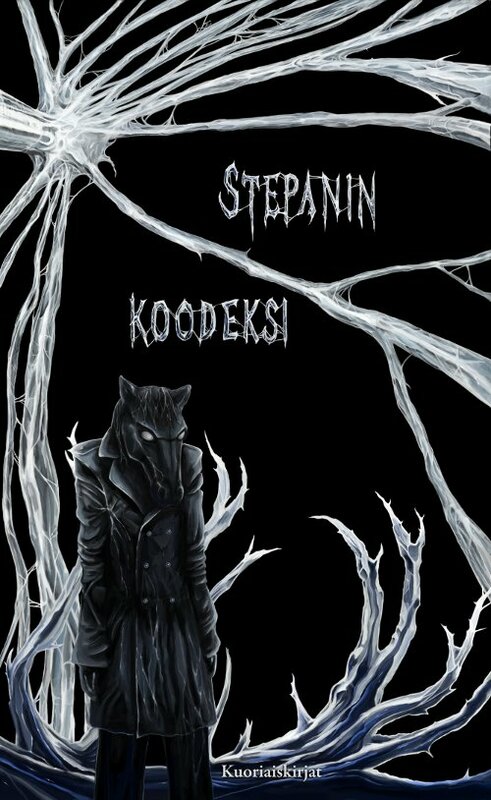 They are more in the field of urban fantasy and new weird. And Caroline Dunford, who has written theatre plays for the BBC and a couple of novels. And many others who haven’t made a breakthrough yet, but certainly will. 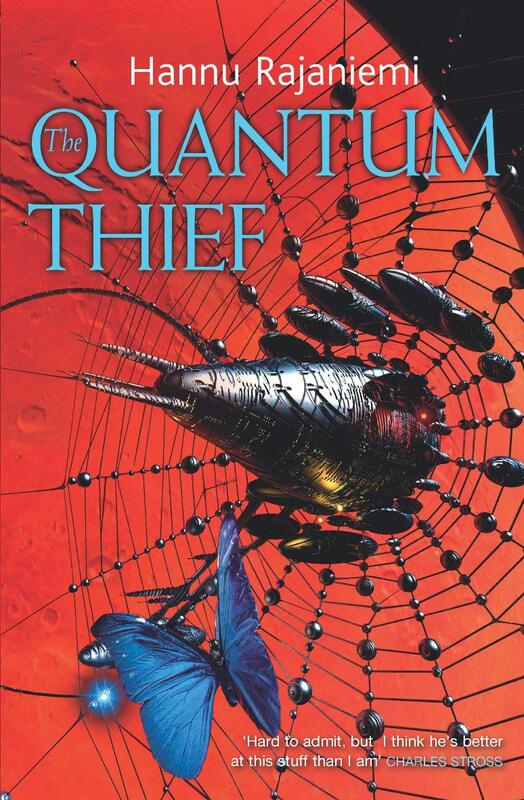 Shimo: Do you already know what you want to write when the Quantum Thief trilogy is done? 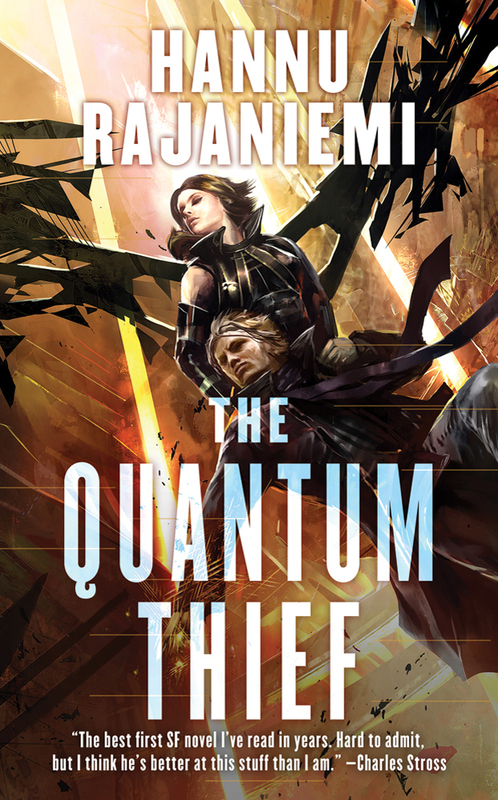 Hannu: I’m sure it will be something completely different from The Quantum Thief. I’m drawn towards fantasy, but I have no clear plans. Shimo: Does the audience still have questions? Here’s your once-in-a-lifetime chance. Someone in the audience: Will the sequels take us back to the Finnish Koto? They’re very interesting. Hannu: Yes, we’ll get back to them quite soon, there will be more about them in The Fractal Prince. Shimo: I need to check this: apparently the character called Mieli* is also Mieli in the English text? Shimo: I only found out about this yesterday. I always thought her name is Mind, but then I found out she’s Mieli in English, too. It was confusing. Hannu: Mieli and the other Oortians are meant to be Finnish, and I hope they have some Finnish characteristics, too. Someone in the audience: What is your topic at the the International Science Day tomorrow? Hannu: Tomorrow I’ll talk about creativity in writing and in science, or in mathematics, to be more specific, and the usefulness of different restrictions and sanctions in them both. Shimo: I heard they will show some documentary film, too. Hannu: The documentary has been made by a group of Italian physicists, it’s about light on a quantum mechanical level. They observe single atoms as they absorb and emit photons, or the energy particles of light. They have recorded a remarkable process on film and for us to see. Shimo: I’ve given what I’ve got, and it seems our audience is not bubbling with questions, either. So, ladies and gentlemen, Hannu Rajaniemi. Let’s give him a big hand! * Translator’s note: mieli is the Finnish word for the mind. Turcosta lähdettiin suunnittelemaan reilu puoli vuotta sitten. Itse en ollut osallisena järjestelyvastuusta, siihen ryhtyivät Tero Ykspetäjä, Harri Miekka, Harri Kiiskinen ja Pasi Karppanen. Kiitoksia vaan, poijjaat, eilinen oli loistava päivä hienossa tapahtumassa! Itse, kysyttäessä, lupauduin kirjoittamaan Turcosen sivuille pienen esittelyn tapahtuman kunniacieraasta J. Pekka Mäkelästä sekä haastattelemaan miestä itse tapahtumassa. Jälleen piti kutinsa se vanhan kansan viisaus, että hyvin tehdystä työstä on palkkana lisää työtä, ja menin lupaamaan pidennetyn esittelyn ohjelmalehteä varten. Mukana luonnehdinnat Mäkelän viidestä kirjasta. Samassa rytäkässä tulin tehneeksi oman lukuennätykseni, viisi kirjaa yhdeksässä päivässä. No, rajat on tehty rikottaviksi. Turcosen tapahtumapaikkana oli Turun pääkirjasto korttelin päässä kauppatorista. Sen keskustammaksi ei juuri pääse ryhtymättä Väyryseksi (iä, iä! ), joten hyvä näin. Tilaksi oli varattu Studio, jossa oli istumatilaa muutamalle kymmenelle. Aivan aamulla ovien avauduttua tuolien määrä vaikutti hivenen optimistiselta, mutta Mäkelän noustessa lavalle sali alkoi jo olla täynnä. Tilaisuuden avasi kirjaston edustaja kertomalla e-kirjoista ja niiden lainauksesta. Päällimmäiseksi mieleen jäi, miten tympeä nykyjärjestelmä vielä on. Toisaalta tässä voisi olla hyvä sauma saada esimerkiksi URSin ilmaiseksi julkaisemia antologioita kirjastoon kaiken kansan ulottuville ja jopa näkyville. Saatavissa olevien e-kirjojen määrä kun ei huimaa päätä. Ehdotankin, että Musta, Valkoinen ja Harmaa antologia ainakin annettaisiin kirjastojen käyttöön. Ties vaikka löytyisi lisää lukijoita, jotka myöhemmin etsisivät käsiinsä muita URS-julkaisuja. Mäkelän kunniavieraspuhe oli jokseenkin epäperinteinen ja juuri siksi niin hieno. Tekstinäytteiden lukua säesti baritonikitara tai jokin muu efekti. Etenkin Muurahaispuusta napattu unenomainen pätkä, jota Mäkelä rytmitti sekä puheen kiivaudella että taustalla kuuluvalla kellon tikityksellä oli hengästyttävä kokemus. Samaan ei oma, äänetön lukeminen yltänyt. Puheen jälkeen koitti kunniavieraan haastattelu, jota olin hieman hermoillut. Perinteisesti vasta deadline oli pakottanut minut ryhtymään puuhaan, tai pikemminkin tuuppaamaan homman vihdoin työlistalla seuraavaksi. Sitä ennen neljä iltaa oli palanut novellin editointiin. Joka tapauksessa muutama merkintä paperissa, koostettu edellisenä päivänä vajaassa tunnissa, ei antanut syytä erityiseen itseluottamukseen. Lisäksi tapaan pälpättää, kun jännittää. Silti, näistä seikoista huolimatta, haastattelurupeama sai kiitosta useammaltakin taholta, ja itsekin mietin heti jälkeen, että tämähän meni hyvin. Suurin kiitos toki kuuluu J. Pekalle ja hänen kiinnostaville vastauksilleen. Häntä menen mieluusti kuuntelemaan uudelleen ensi vuoden Finnconiin, jossa hän myös on kunniavieraana. 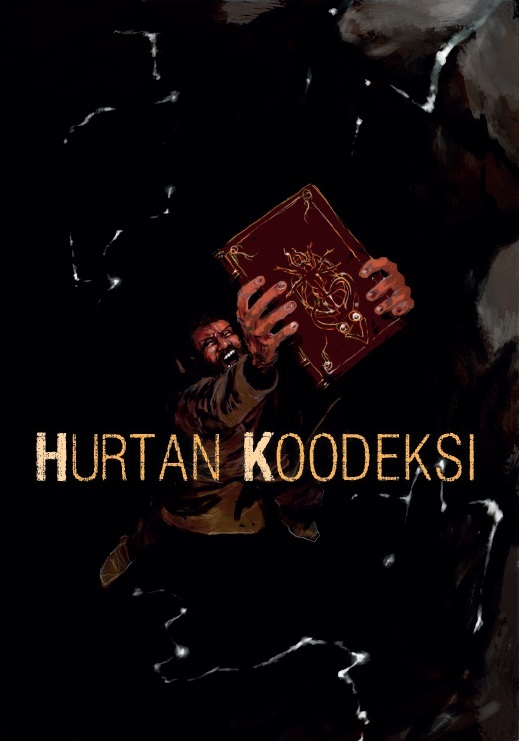 Kehotan muitakin yhtymään tähän pyrkimykseen. Seuraava aihe oli pulp-kirjallisuuden uusi tuleminen, josta olivat kertomassa Tuomas Saloranta (URS-liikkeen primus motor), Juri Nummelin (kaikenkarvaisten antologioiden monitoimiottelija), Vesa Sisättö (menestynyt pulp-kirjailija) ja eturivistä kommentoiden Boris Hurtta, joka tykitti menemään suuria totuuksia. Merkittävä pala keskustelua koski pulpin määritelmää, joka vaikutti yhtä yksinkertaiselta kuin science fictionin tarkka rajaus. 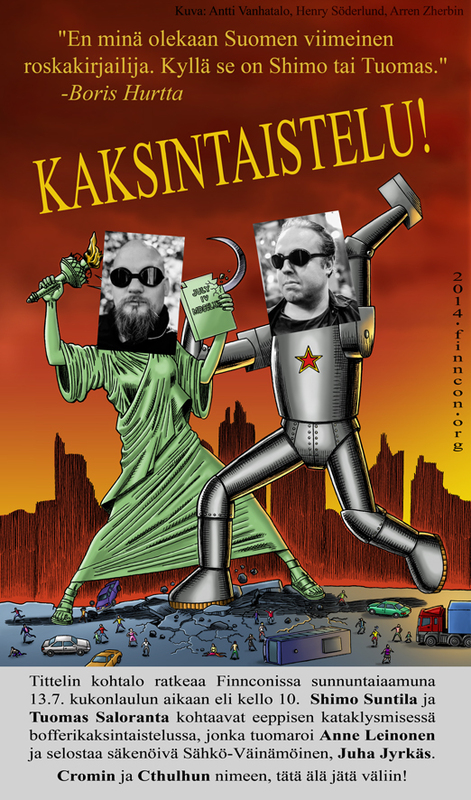 Samalla kun peilattiin kaukaista historiaa, katsahdettiin myös kioskikirjallisuuden menneisyyteen Suomessa ja lopuksi hahmoteltiin, mitä pulp voisi olla tulevaisuudessa. Onko se e-kirjoina julkaistua viihdettä, Prisman hyllyssä myytäviä kummitustarinoita vai kenties jotain ihan muuta? Koska mikään ei ole yhtä absoluuttinen totuus kuin mielipide, oli keskustelu suosikkiscifihahmoista hyvinkin antoisa. Etukäteen lupautuneista panelisteista paikalla oli Nadja Sokura ja Sari Polvinen, sairastuneita paikkaamaan rekrytoituja puolestaan edusti Ben Roimola ja allekirjoittanut. Tehtävänanto oli hyvin yksinkertainen: Nimeä suosikkihahmosi ja perustele. Muut saivat sitten kommentoida muiden valintoja ja yhdessä vaiheessa punnittiin, kuka näistä voittaisi, jos he ottaisivat matsin keskenään. Nadjan valinta oli Sarah Connor Terminaattori-saagasta, minä liputin tottakai kapteeni James T. Kirkin puolesta, Sarin suosikki oli C. J. Cherryhin Cyteen-romaanin päähenkilö Ariane ja Ben liputti Valerianin ja Laurelinen puolesta. Arianea en (vielä) tunne, mutta en voi kyllä sanoa nyrpisteleväni yhdellekään esiinnostetulle hahmolle. Yleisökin tuli mukaan jutusteluun johdattaen pohdinnan myös pahisten leiriin. Koko hässäkkää usutti vauhtiin Tero omilla kysymyksillään hallintapaneelien takaa. Harmi että aika loppui, keskustelut olivat mielenkiintoisia ja hyvin niitä olisi jatkanut vielä tunnin lisää. Viimeisenä ohjelmana Jukka Halme ja Marianna Leikomaa suositteli kiinnostavia kirjoja lähimenneisyydestä ja välittömästä tulevaisuudesta. Lista herätti suuria lukuhaluja ja kaikille, etenkin Turcoseen osallistumattomille, onneksi tuo lista tulee julki ja yleiseen jakoon. Nostona listalta poimin Kim Stanley Robinsonin teoksen 2312, joka luotettavista lähteistä peräisin olevan tiedon mukaan pitää olla luettuna, jos aikoo ylipäätään keskustella nykyscifin suuntauksista tulevana vuonna. 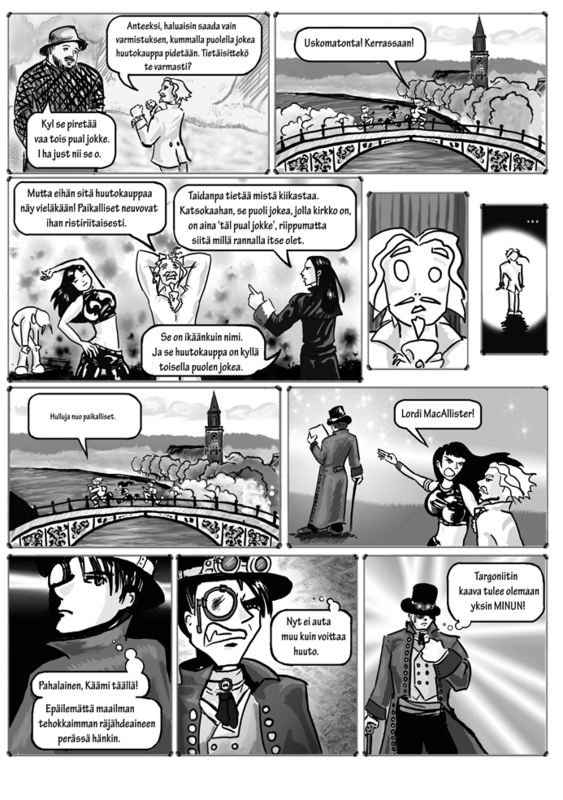 Mainitsen myös Hannu Rajaniemen seuraavan kirjan The Fractal Prince, jota Marianna odottaa malttamattomana, koska aivan ensiksi eniten myös minä odotan juuri sitä. Varsinaisen tapahtuman jälkeen vierailimme Turun Sarjakuvakaupassa kadun toisella puolen ja sain mukaani pari arvosteltavaa sarjista. Pysykää kanavalla. Sammakon kirjakaupassa nurkan takana oli jaossa Mäkelän signeerauksia, mutta tämän rastin olin itse jo hoitanut aiemmin kuntoon ja lähdin kiikuttamaan jälkikasvun yökamppeita anoppilaan. Ilta jatkui vielä Teerenpelin kabinetissa varsin pitkään, itse luikahdin sieltä kotimatkalle joskus puolen yön tietämissä. Paikka oli oiva, keskusteluihin pystyi ihan normiäänellä ja kabinetin oma baaritiski piti juomatarjoilun likellä. Turconen oli juuri sitä mitä oikeastaan scifitapahtumilta odotan. Hyvää ohjelmaa ja hyvää seuraa. Itseasiassa tällaiset päivänmittaiset tapahtumat (muina esimerkkeinä Tähtivaeltajapäivät ja Tamfan) toimivat jopa paremmin kuin Finnconin kaltaiset megatapahtumat. Yksi ainut ohjelmalinja takaa sen, että jokainen osallistuja näkee ne samat esitykset ja jälkeenpäin on mahdollista keskustella niistä. Kokemuksesta tulee yhteisöllisempi. Tämä myös heijastuu yleisön intoon ottaa osaa keskusteluihin esiintyjien kanssa ja se on mielestäni yksi tärkeä osa muodostamassa tapahtuman yleisfiilistä. Oma vahvuutensa oli myös mikrofonien määrä, mikä aluksi vaikutti pieneltä heikkoudelta. Kun mikkejä on vain kaksi ja esiintyjiä enemmän, päällepuhuminen ja sivukommenttien viskely ei ole niin helppoa. Puheenvuoroa pitää melkeinpä pyytää ojantamalla käsi mikrofonin toivossa ja toisaalta se annetaan ojentamalla sillä hetkellä käyttämätön mikki. Nähdäkseni tämä toi tiettyä järjestystä niihin pariin esitykseen, joissa osallistujia oli kahta useampi. Turconen oli tapahtumana kerrassaan loistava ja toivottavasti se järjestetään vielä uudestaan, esimerkiksi kakhden vuoden kuluttua. Jos syksyinen päivätapahtuma kiinnostaa ensi vuonna, Tampereella on silloin tiettävästi Tamfan. Myös huhuja Vantaalla järjestettävästä kevättapahtumasta liikkuu, olkaa siis antennit auki! Kiitokset järjestäjille, esiintyjille, kunniavieraalle ja etenkin yleisölle. Näin kutkuttavalla scififiiliksellä jaksaa painaa pitkälle. Jopa kirjoittaa tapahtumaraportin sen ajattelemisen sijaan. Sanat: Shimo, Kuvat: Arren. Teeaika – esittely.